Becoming a bonafide fashion darling is bloody hard work. The industry as a whole has a nonchalant air of ‘been there, done that, got the Alexander Wang tshirt’. While a rising starlet work their way into being flavour of the month for a couple of designers for a while, it’s incredibly difficult to forge a lasting impression and relationship with the fashion industry. Not to say it’s impossible, just look at the likes of Diane Kruger and Cate Blanchett who have been courting the fashion world for years. This is why it’s so impressive that in less than a year, the stunning Kenyan actress Lupita Nyong’o has not only become a legit fashion darling and THE one to watch on the red carpet, she even has Anna Wintour on-side. Lupita in Gucci at the SAG awards. 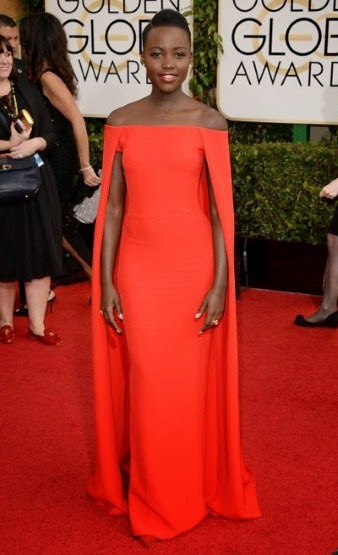 Lupita in Ralph Lauren at the Golden Globes. Lupita in Dior at the 12 Years A Slave luncheon. Lupita in Chanel at the BAFTA nominees party. Lupita in Elie Saab at the Paris premier of 12 Years A Slave. Lupita in Lanvin at the premier of Non Stop. Lupita in Prada at the Oscars.